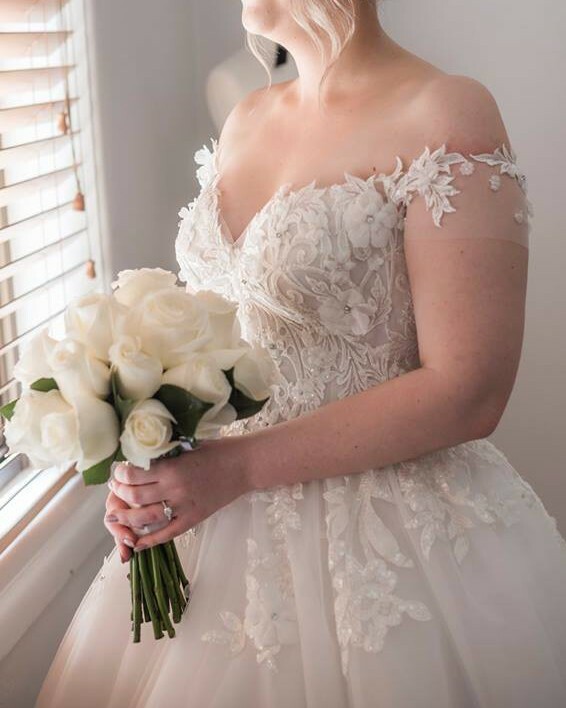 This gorgeous dress made me feel amazing on my big day and I am hoping someone else will get just as much joy out of wearing it. So many people told me I looked like a princess and that is exactly how I felt. George did such an amazing job at designing a flattering timeless piece for me and it would be a shame to see it only worn once. I am an Australian size 12/14 with size C/D chest. VEIL NOT INCLUDED. I have added pictures so you can see how a simple long veil can add to this gorgeous gown. The dress is in fairly good condition however there are a couple of things you should know. One of my guests was having a little too much fun and tripped leaving a couple of holes in the outer layer of the tulle skirt. This could be fixed by removing or replacing the top layer. The sleeve also tore slightly open. This is hardly noticeable. Pictures have been included of both. I have had the dress dry cleaned and it looks lovely and clean on the exterior. There are some faded grease marks underneath the trail which couldn't come out with basic dry cleaning. I didn't want to risk damaging the dress by putting it through a more rigorous clean, however if it bothers you I have been told this is an option. I can send pictures if you like, however it would not be visible unless the train flips over. Once you send a message, Kassandra can invite you to purchase the dress.